Display for your upcoming marketing events. Our mission at Oak Cliff Cargo Bicycles is to build hand crafted, affordable Dutch style cargo bicycles for the masses made in Oak Cliff, TX. In order to do that, our main focus is re-purposing existing bicycle frames, components and other raw materials in order to keep these items from being buried in our land fills. This also helps us keep them quite affordable, selling at 50% less than other cargo bicycles made in the United States. 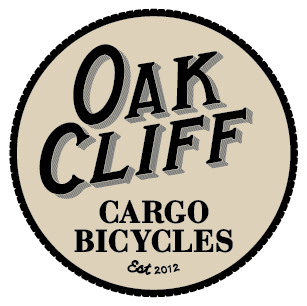 This Sunday, April 21, 2013, Oak Cliff Cargo Bicycles will be a vendor at this year’s Oak Cliff Earth Day. We feel very close to this special event and day, and look forward to building more of these special and environmentally friendly bicycles for you! Previous Previous post: Attending the White Rock Local Market this Saturday!